This page shows how to configure and enable the ip-masq-agent. You must also apply the appropriate node label to any nodes in your cluster that you want the agent to run on. In most cases, the default set of rules should be sufficient; however, if this is not the case for your cluster, you can create and apply a ConfigMap to customize the IP ranges that are affected. For example, to allow only 10.0.0.0/8 to be considered by the ip-masq-agent, you can create the following ConfigMap in a file called “config”. By default, the link local range (169.254.0.0/16) is also handled by the ip-masq agent, which sets up the appropriate iptables rules. To have the ip-masq-agent ignore link local, you can set masqLinkLocal to true in the config map. The ip-masq-agent configures iptables rules to hide a pod’s IP address behind the cluster node’s IP address. This is typically done when sending traffic to destinations outside the cluster’s pod CIDR range. NAT (Network Address Translation) Is a method of remapping one IP address to another by modifying either the source and/or destination address information in the IP header. Typically performed by a device doing IP routing. Masquerading A form of NAT that is typically used to perform a many to one address translation, where multiple source IP addresses are masked behind a single address, which is typically the device doing the IP routing. In Kubernetes this is the Node’s IP address. CIDR (Classless Inter-Domain Routing) Based on the variable-length subnet masking, allows specifying arbitrary-length prefixes. CIDR introduced a new method of representation for IP addresses, now commonly known as CIDR notation, in which an address or routing prefix is written with a suffix indicating the number of bits of the prefix, such as 192.168.2.0/24. Link Local A link-local address is a network address that is valid only for communications within the network segment or the broadcast domain that the host is connected to. Link-local addresses for IPv4 are defined in the address block 169.254.0.0/16 in CIDR notation. 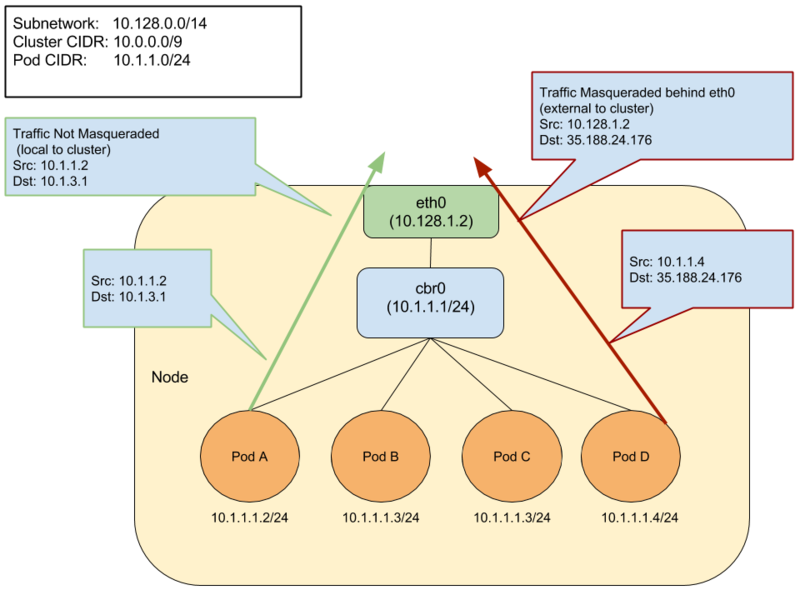 The ip-masq-agent configures iptables rules to handle masquerading node/pod IP addresses when sending traffic to destinations outside the cluster node’s IP and the Cluster IP range. This essentially hides pod IP addresses behind the cluster node’s IP address. In some environments, traffic to “external” addresses must come from a known machine address. For example, in Google Cloud, any traffic to the internet must come from a VM’s IP. When containers are used, as in Google Kubernetes Engine, the Pod IP will be rejected for egress. To avoid this, we must hide the Pod IP behind the VM’s own IP address - generally known as “masquerade”. By default, the agent is configured to treat the three private IP ranges specified by RFC 1918 as non-masquerade CIDR. These ranges are 10.0.0.0/8, 172.16.0.0/12, and 192.168.0.0/16. The agent will also treat link-local (169.254.0.0/16) as a non-masquerade CIDR by default. The agent is configured to reload its configuration from the location /etc/config/ip-masq-agent every 60 seconds, which is also configurable. nonMasqueradeCIDRs: A list of strings in CIDR notation that specify the non-masquerade ranges. masqLinkLocal: A Boolean (true / false) which indicates whether to masquerade traffic to the link local prefix 169.254.0.0/16. False by default.